You must make bookings at least 5 minutes in advance of the time at Duke of York. Established in 1826, The Duke of York sits at the top of St John’s Wood High Street and still retains much of its original charm. Inside, it’s a warm, welcoming space with a bar and casual dining area – usually full of well-heeled locals – and a more secluded separate dining room that is popular with a post-work crowd looking for great food in a relaxed setting. The comprehensive wine list is regularly updated and offers a good mix of European favourites and new world alternatives. 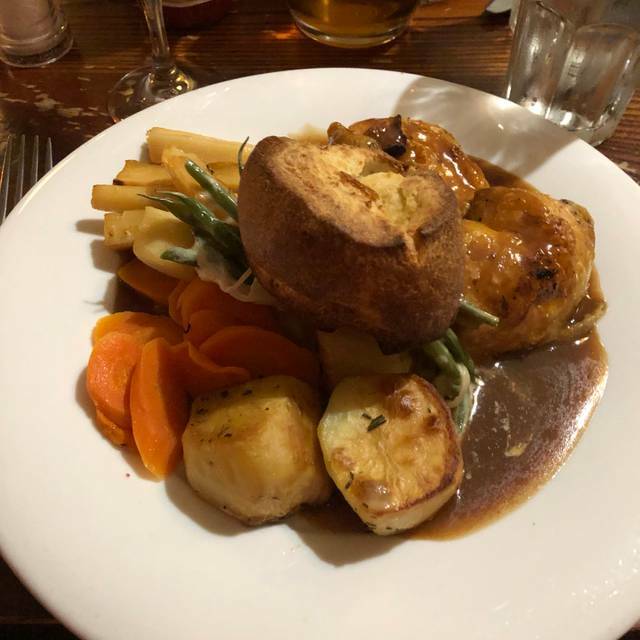 Classic dishes like beer-battered cod with yorkie fries; beef and Guinness sausages with mash potato and onion gravy; and chargrilled rib eye steak feature on the all-day menu. The Sunday Roasts are also highly recommended. Very pleasant gastropub with interesting menu and quality of food was good. Went at lunchtime weekday with children and staff very helpful. Thought the service was lovely, the two girls really have character, I’m a waitress myself and think they are doing a great job. LOVE the vegan burger and the price for drinks is also decent! Excellent food especially the pasta and risotto, service was friendly and overall, highly recommended. Good food at fair price, but a bit crowded feel. Seems staff is overworked and a bit stressed. To many tables in tight space, especially ground floor. The friendly service at the Duke makes it “our” special place to go & take friends visiting London. Everything was outstanding, the seafood risotto out of this world, and we enjoyed a fun evening!! Beautifully decorated for the holidays. Even a nice surprise for the children and Christmas crackers for everyone. Simply GREAT! A traditional pub that combines ‘Tradition and Gastro’ Brilliantly! The ambiance and the food amazing, espacially the steaks, not to mention the beer, my husband says the best pint in London and believe me he has ‘sampled’ a few! Great night! Food was really delicious and we will definitely go back! Delicious Sunday roast. Our reservation was for 4:30 and they were already out of the beef, but the chicken was very good. The Wagyu burger has was out of this world!!! Excellent food, excellent service and worth visiting anytime we're in London. As always the Duke warmly greeted with some friends from Guatemala who're visiting London and made for a special evening. The service was impeccable, the food tasty and the whole experience was fabulous. Congratulations to Enzo + the team!!! The beer is good and food is simple but excellent, I have been a few times now and the Steak I had was one of the best, and defiantly not overpriced. The service is fast and friendly and nothing is too much trouble. With the summer we have just had sitting outside was a real treat, and inside is nice and cosy as well. Great food and service. They made my son's birthday special. Went on beef night, had excellent steaks, better than expected! Always enjoy my visit to this busy pub when I'm in the area. Best to reserve a table because they are usually very busy!!!! 1pm lunch whilst going to cricket, although very busy it was extremely well organised, service was good and steaks were pretty good quality. We were fed and watered and out into the rain ! in an hour and a half. No cricket great lunch. A most enjoyable meal. Really good value. Disappointed after all I’d heard about it from locals. Food choice was predictable and average quality. Atmosphere spoiled by man, perhaps Caribbean, ‘singing’ outside our windows for at least an hour with no move by staff to move him on. Lunch up the road from Lords. You'll need to book as it was packed, but excellent service, orders taken quickly, food very good and fairly priced. Recommended. Back at the cricket fed and watered with an hour and a half. Really great place for a test match lunch. Steak was good but not ad good as in previous years. Best steak in all of london ! It never disappoints and is always welcoming and friendly. As always the Duke came through with flying colors!! The food was delicious, the service impeccable! Excellent as always, food, ambiance, service just PERFECT!! great steaks and service but slightly let down by dirty plates and waiters holding glasses around the rim. Would certainly recommend it though. I was only in town for a few days and decided on the Duke of York because it was nearby. A candle-lit table was waiting for me when I arrived and the staff was super welcoming and attentive all night. The sweet potato, fig, goat cheese salad was one of the best things I have ever put in my mouth. The steak and ale pie was amazing. I wish I could have finished it. I loved the Duke of York and would go back any time. Really good quality steaks. Highly recommended for steaks and they do a deal on Wednesdays including a glass of wine. In a word ‘BRILLIANT’ food, service, ambiance, ALL EXCELLENT!! A truely AMAZING find, my husband said the best pint of lager he has had in London ( he has had a few)!! We had the steaks which were delicious but every meal that was being served up looked delicious. A two minute walk from St. John’s Woodtube station so very easy to get to and find. Will DEFINITELY be back, another statement from my husband, this will be my local from now on!! My wife and I had a nice Saturday dinner. The burgers are really good and there is a very good variety including venison and ostrich.